Founded in 1987, the Hawks Athletic Club (HAC) is a volunteer operated, non-profit organization formed to organize and administer minor hockey in North West Edmonton. An Executive Committee and Board of Directors is formed from the general membership to carry out this mandate. The HAC is open to all boys and girls, aged 4 though 12, residing in the City of Edmonton, north of Stony Plain Road and the MacKinnon Ravine to the City boundary and west of 97 Street to the City boundary (exclusive of the communities known as Westwood, Rossdale, Griesbach and Rosslyn). You will find our program fun, exciting and competitive, with our main goal being the development of skating and hockey skills. We represent over 30 communities with teams in the Initiation (Discovery, Jr Timbits & Sr Timbits), Novice, Atom, and Peewee categories. 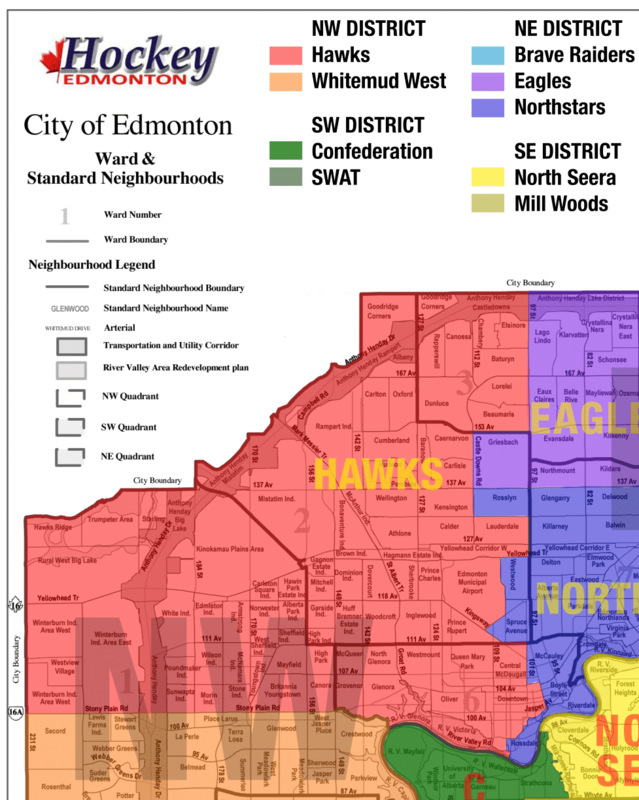 For more information on our club's boundaries, check out Hockey Edmonton's district map. The Executive Committee consists of elected members with elections held yearly at the Annual General Meeting. Appointed Board Members, Directors and Sub-Committtees are formed to undertake projects such as evaluations, tournaments, discipline, etc. The Executive Committee, its Directors and Board Members meet approximately once a month. The Hawks Athletic Club is dedicated to providing a quality hockey program for all players, on all teams, at all levels, while striving for fair play, team work and commitment.